The 270 mile race round the south of Ireland from Dublin to Dingle is held every two years - alternating with the Round Ireland race. We were hugely fortunate this to have an Irish charter for Nisida and to take part in this race for the first time. 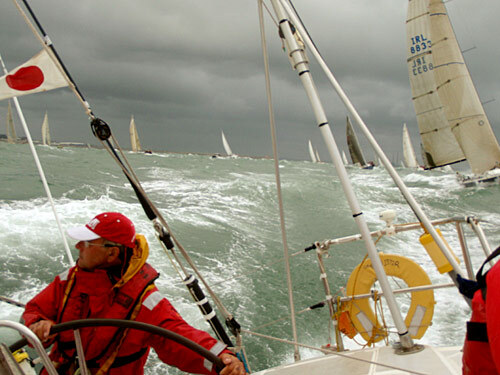 We were also fortunate in the timing of the race - which allowed us to break Nisida's passage back from Antigua to the UK in Dublin, spend a week there getting back into race mode while enjoying Dublin's highlife and then leg it back to the UK from Dingle in time for the Round the Island Race. The weather in Dublin from our arrival in Dublin was glorious - unbroken sunshine and little wind. But forecasts were for very different weather for the race itself - a northerly force 6/7 promising a fast if bouncy race. And the forecasts were right! The course record of 33 hours 20 minutes for the 270 mile D2D race was set by TP52 Patches four years ago; we crossed the finish line in Dingle harbour 29 hours 45 minutes after the Saturday morning start. Up to 40 knots of wind overnight saw us hitting speeds up to 18 knots before we dropped the spinnaker as the wind backed as we shot past Cork. We were 3rd over the line, losing a tacking duel on the line with Tiamat, the Irish Commodore's Cup boat, and well behind 79ft Whisper. We finished 6th out of 37 entries on corrected time and (tacking duel apart) were very pleased with ourselves. Finishing on Sunday afternoon rather than the expected Monday made for plenty of time to sample Dingle's 52 pubs and swap stories with the rest of the fleet.